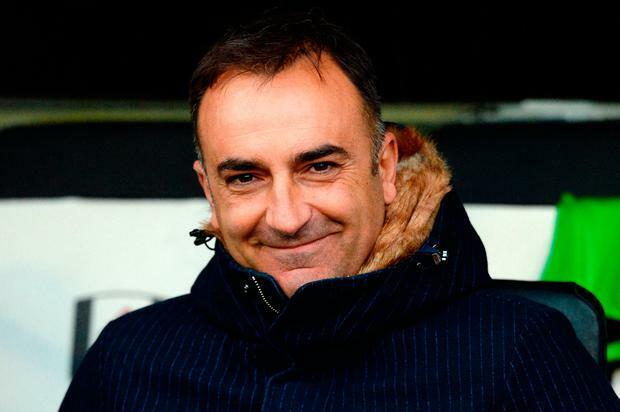 Swansea City have surprisingly appointed Carlos Carvalhal as their new head coach just four days after he left Sheffield Wednesday by mutual consent. The 52-year-old Portuguese will take charge until the end of the season - with an option to stay on longer - as Swansea desperately battle against Premier League relegation. Following the sacking of Paul Clement, Carvalhal becomes Swansea's fifth boss in two years, with the club having been determined to make an appointment before the January transfer window opens. Carvalhal took training yesterday morning before being presented to the media ahead of his first match, away to Watford, who are managed by fellow Portuguese Marco Silva, tomorrow. The focus will now be on Swansea's transfer business next month, with the club accepting that serious mistakes have been made in the past few windows. Carvalhal said he had not yet discussed plans with chairman Huw Jenkins, claiming that taking the job appealed to his "romantic side". "I deal with footballers. If we need separate players, I will try and choose them but the money is not what I want to talk about. I am allergic to money," he said. West Ham United are planning to bid for defender Alfie Mawson but Swansea are unlikely to sell for less than £25m (€28m), while their priority is to bring in more creative players, including another striker, having lost their main goal threat last summer when they sold Gylfi Sigurdsson and Fernando Llorente. Carvalhal will also attempt to re-build the confidence of Renato Sanches, the Portuguese midfielder on loan from Bayern Munich. "I think he needs confidence. We can sometimes forget he is still a kid and only learning," Carvalhal said. "He needs a role in the team and time to understand the roles everyone has. He will be involved in the dynamic and when he understands what we want he can be a big player for this team." The 52-year-old has managed 14 clubs in four different countries, including at Sporting Lisbon and Besiktas, but was let go by Sheffield Wednesday after the defeat at home to Middlesbrough - who also sacked their manager Garry Monk, appointing Tony Pulis - only last Saturday.